Our Boulder City terminal is located at the Boulder City Municipal Airport, just a short distance from the Las Vegas Strip. This spacious facility serves as the departure point for tours to both rims of the Grand Canyon. This location also features a sizable gift shop as well as a cafe and souvenir photo counter. 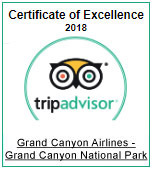 Located at the Grand Canyon National Park Airport, this state-of-the-art facility accommodates more than 1,000 passengers per day. Guests will enjoy browsing the gift shop, sipping coffee from the espresso stand, or simply lounging and watching aircraft landings through the massive panoramic windows. Due to the growing popularity of Grand Canyon West, this station has recently expanded to accommodate the ever-increasing number of visitors. The West Rim terminal sees daily service from Las Vegas and features shuttle transport to multiple stops along the canyon's rim. The Page terminal is stationed within the Page Municipal Airport, just minutes from breathtaking sights of Lake Powell, Tower Butte, Horseshoe Bend, and Rainbow Bridge. Guests can enjoy scenic desert views from the waiting room windows or shop for souvenirs in the gift shop.